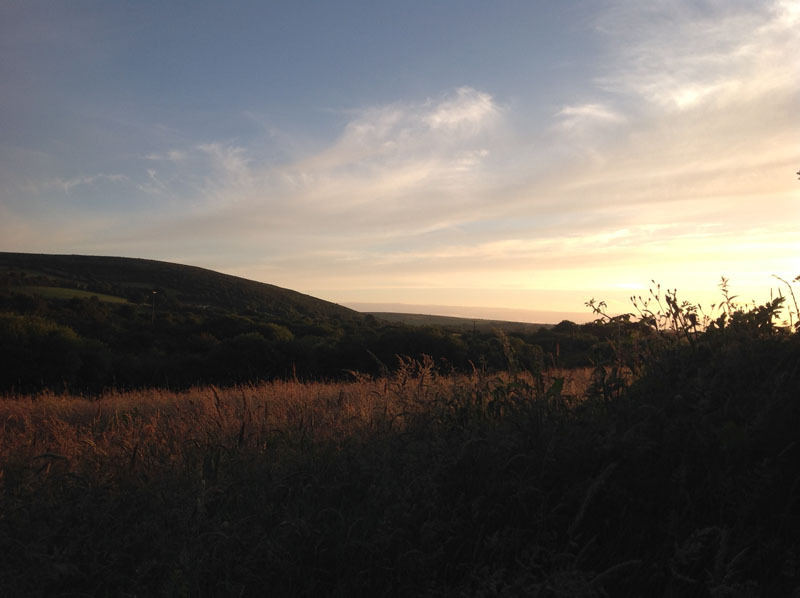 We were incredibly lucky to find a home on the very edge of Bodmin Moor, one of Cornwall’s wild beauty spots and an AONB, tucked away but within easy reach of the rugged and glorious North Cornish coast. As part of the new property came a paddock, a couple of stables, and a tumble-down metal-clad small barn, which the previous owner had obtained planning permission to demolish and replace with a rather basic little bungalow, to use as a holiday let. Very quickly, we decided that this was a project that we wanted to take on. We completely fell in love with this peaceful place – and we’re rather gambling on the fact that our visitors will feel the same way! The original designs for the cottage were distinctly uninspiring, so we asked Mark Kemp, from Parkes Lees Architects in nearby Launceston to take a fresh look at the project. The location and site provide constraints for the build; out of consideration for the site, and our neighbours, we wanted the cottage to sit as lightly as it possibly could, both in terms of its ecological footprint and the visual impact in such a beautiful location. The design that Mark has come up with, we think, fits the brief perfectly. Little Crifts Cottage will nestle into the space the barn used to occupy, between two stone Cornish banks and the cottage’s garden space, which is stepped up a level from the cottage itself and has the most fabulous sunset views over Bray Down and Carne Down to the South and West. The cottage will have two double bedrooms and an open plan living and dining space, along with a really well equipped, good sized kitchen – we’re keen cooks ourselves and have been frustrated by disappointing, under-equipped kitchens in self catering accommodation in the past – and a hotel-style wet room. The living spaces are to have slate floors with underfloor heating, and a wood-burning stove will complete the fit-out, providing extra warmth and a delightful treat for those autumn and winter evenings. The open plan living space will have a fully glazed corner which should allow morning sunshine to flood in, and will open onto a small area of decking protected by an overhanging roof, so that our visitors can enjoy sitting and eating outside even if the Cornish weather is in a ‘liquid sunshine’ mood! Just after Christmas, the plans went back to the planning department at Cornwall Council and were finally passed in March this year, allowing us to get on with the nitty-gritty of the build planning. After selecting a main contractor and timber frame building specialists, we were ready finally to get on with the building works, starting with clearing away the old barn – and I’ll tell you all about the works so far in the next blog post! We hope to welcome our first visitors by Easter 2016. Please do follow and check back here, and follow our progress on twitter @CornishHaven – blog and twitter followers will be the first to hear about our really special, very limited opening offers when we start to take bookings. If you were wondering what we’ve been up to lately… It’s this!